You’ve tried all the quick fixes with no luck. How can you sidestep the complicated parts of the troubleshooting process and zero in on an easy solution? Search the Web. It’s likely that you are not the first or only person to have experienced your problem, so chances are good that you’ll discover solutions online. With a bit of luck and a dash of persistence, you can succeed most of the time. If you can type in the exact text of your error message or otherwise summarize your problem using a few keywords, you’re especially likely to get helpful results using Google. Use quotes to enclose exact phrases; this reduces the number of unwanted results. For example, if you type in the error message "the Preferences File Could not be opened. The end of file was reached. -39", you’ll get this useful Microsoft Entourage Help Page, which tells you what to do if you have a damaged Identity database file. If you instead just type Entourage -39, you’ll have to wade through a lot of information about HBO’s Entourage series. If Google comes up empty, search the support sites for the products that are giving you trouble. 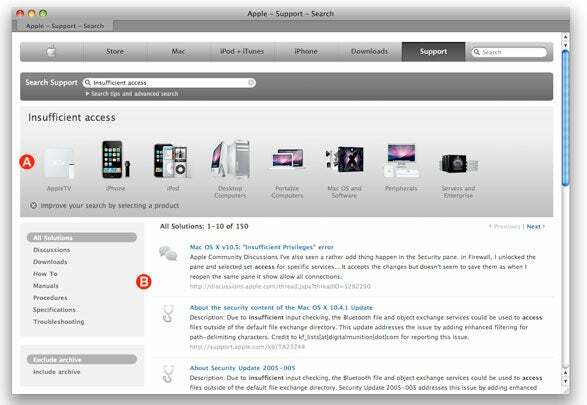 For OS X in general, or for any Apple products, there’s no substitute for searching Apple Support. After you type in your search terms, the results will typically take you to articles in Apple’s Knowledge Base and threads in Apple’s Discussions section. The Discussions threads are often more fruitful, as they include tips from readers for fixing problems that Apple may not yet have officially acknowledged. The Apple Support site gives you a number of ways to home in on the answers you seek. For example, as with most search engines, you can use Boolean operators. Include the word AND when you want to search for documents that include both of your search terms—macbook AND battery. Likewise, use OR to find either of two terms and NOT to exclude a certain term. Enclose specific terms with quotation marks. Also take advantage of the site’s ability to limit your search to certain products. After you type in your search string, you may see a blue circle with a plus sign (+) in it next to the words “Improve your search by selecting a product.” Click on this to reveal images of Apple’s product line. Choose one to limit your search to just that product. You may also find it useful to familiarize yourself with the icons Apple employs to show what sort of articles you’ve uncovered with your search. For instance, if one of your results has a stethoscope icon next to it, it’s a troubleshooting document—that’s a good sign it might contain the info you need. Looking for help? The Web might hold the answer. The Apple Support site lets you search using Boolean search operators such as AND, NOT, and OR. To drill down further, you can limit your search to a certain product family (A). The site also gives you visual clues about what sorts of information you've uncovered. For instance, a stethoscope icon indicates troubleshooting documents, while speech bubbles indicate information from the user forums (B). Not every fix you find online will actually work, at least not for your particular variation of the problem. And don’t assume that just because a user posting says you must do something extreme, such as erase your hard drive, it’s absolutely necessary. Less radical solutions may exist. Read through several postings on a subject before deciding on a course of action. Start with the simplest, least time-consuming solutions, especially if there appears to be a consensus that it works. Using the Web, you’ll find solutions that you would never discover on your own, no matter how many hours you spent on do-it-yourself troubleshooting. As one example, an Apple support article describes what to do if the Finder refuses to let you rename a file, claiming that you don’t have “sufficient access.” Part of Apple’s solution requires that you enter the following command in Terminal (/Applications/Utilities) and press return: sudo chmod -RN ~. Unless you are experienced with Unix (and perhaps not even then), this is not something you would ever think to do on your own.